Corner Brackets are great for connecting items without the need for machining. They allow the fastening of two pieces of extrusion at a 90° angle. 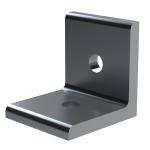 All of our aluminum Corner Brackets are clear anodized and come with or without T-Slot hardware.